probably more likely to begins the season as the Syracuse closer. a career-low 8.7 mark in ’13. to Harrisburg for more seasoning before moving up to Syracuse. cutter and two-seam fastball along with the hybrid split-change. good enough for middle relief. changeups and a good, 12-6 curveball. best vs. LHBs. Best bet for 2014 = Harrisburg. peripherals — 1.276 WHIP, 3.0 BB, and 9.8 K/9IP. but did not repeat Auburn despite making just four appearances. 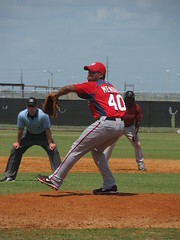 his fastball (which was quite live when I saw him) in short stints. (CH, CV) to complement the fastball, cutter, and slider. likely he’ll return to the Muni for a few more weeks. yard (next HR allowed will be the first) and gets a ton of groundball outs. and Auburn after a month’s delay in getting him a visa as a Canadian, eh. pitches. Likely to spend ’14 in Low-A Hagerstown. Career Stats Giolito returned to pitching just 10 months after having TJ surgery. (FB, CV) and a third pitch (CH) that could be just plus (oh, the horror). first Suns start in May, not April. organization plans to move him up. a mid-90s FB (touching 97), 11-5 CV, and also throws the CH.